It is that time of year again: Tottenham have to go to Stamford Bridge and donate three points to Chelsea’s title challenge fund. While travelling Spurs fans will go hoping for a reversal of fortunes, it is perhaps more unlikely than ever that their side will get their first win on the Blues’ ground since 1990. Successive draws in the last two Bridge-based encounters between the teams suggested that the gap between them was closing, but events this season have restored it to a sadly familiar and colossal size. Chelsea have bought shrewdly and sold wisely, and just about maximised their potential; Tottenham’s own transfer splurge looks foolhardy by comparison and their chase for fourth was more or less dead in the water by mid-December. The scale of Spurs’ self-sabotage is summed up by the fact that the tactical battle on Saturday will be between José Mourinho, serial trophy-winner and two-time European Champion, and Tim Sherwood, who has done the square-root of nothing and, on the basis of what has happened so far, looks set to achieve exactly the same amount in the rest of his career. While one club stabilised and modernised its playing strategy, the other short-sightedly dispensed with up-to-date ideas and chose to fall back on bulldog spirit, hubris and blind faith to muddle through. In contrast to Sherwood, who has all-too-often looked out of his depth and needed to be bailed out by individual class, Chelsea’s returning Special/Happy/Eye-Gouging/Insufferable (delete as applicable) One has instilled a winning mentality, insurmountable resolve and absolute tactical discipline. Controversially, he has made the Blues’ midfield much more muscular and defensively dependable, at the expense of the club’s best player of the last two seasons, Juan Mata. What made the exclusion and sale of the Spaniard most confusing was that he was as productive as he was watchable: last season, Mata was Chelsea’s top-ranking assister (12), chance creator (2.7 per game), through-ball player (0.2 per game) and their second top scorer (12). However, it seems like the statistics that Mourinho paid most attention to were Mata’s tackles per game (0.7), times dispossessed (2) and turnovers (1.3), all of which ranked him among Chelsea’s worst players and, apparently, made him an unaffordable luxury. By contrast, Willian, Mata’s replacement – at least for the purposes of this argument – has posted 1.9 tackles per game while being dispossessed 0.9 times per game and turning the ball over 1.1 times. While it would be somewhat disingenuous to say that replacing Mata with the Brazilian has single-handedly contributed to Chelsea’s transformation from watchable but flaky outfit into potential title-winners, it has been a decisive factor into making them a more rounded team. Indeed, a very rounded team is what Spurs are going to face. With the obvious and well-known exception of the centre-forward position, Chelsea have world-class quality throughout the side and a clear and well-understood way of playing. 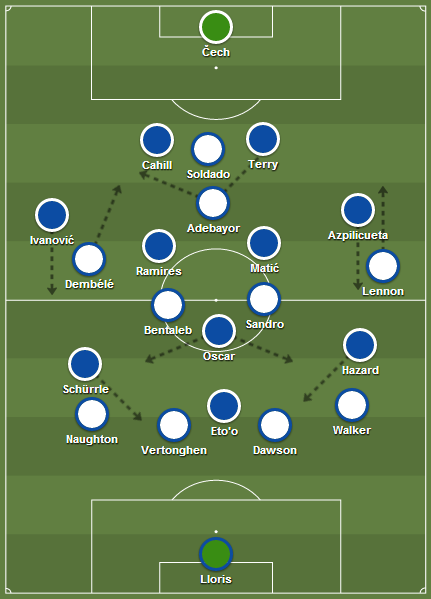 Like most top sides nowadays, they look to dominate the ball, play a progressive short passing game and focus their moves down the flanks, with an intelligent number ten – Oscar – joining the wide players – typically Eden Hazard and Willian – to combine and overload opposition full-backs and get into the central area. Their attacks this season have been perfectly split from the perspective of the manager: 35% down the right flank, 35% down the left and 30% through the middle. Unlike classic Mourinho teams of yore, they do not look to counter-attack or look to draw their opponents out by letting them have the ball, the away game at Manchester City being the exception that proves the rule. Presumably Roman Abramovich’s well-publicised preference for tiki-taka is a reason for this, but equally important is the fact that Chelsea’s opponents usually seem desperate to park the bus rather than to attack them. As Mourinho must have realised during his ill-fated spell at Real Madrid, the only real solution to this problem is to focus on playing a proactive game from the off. As the Portuguese has reminded the press this season, his side is a work in progress and they are yet to reach their peak. Thus their commitment to this still-developing style occasionally leads to them looking rather sterile and uninventive, but nonetheless they have tended to find a way through more often than not. Chelsea will presumably play their strongest eleven for this fixture, which means Petr Čech taking his place in goal, restored to his best by the stability of strategy and personnel selected in front of him. Multi-time ‘World’s Hardest Man’ and ‘Owner of the Biggest Arse Ever Seen on a Football Pitch’ Branislav Ivanović will play at right-back, with Gary Cahill partnering noted [redacted] John Terry at centre-back. In the middle, Ramires, David Luiz and Frank Lampard seem to be competing for the spot alongside the already indispensable Nemanja Matić. I must concede that I did not see Matić transforming the side so obviously: with such clear problems up front and ongoing concerns over squad depth, I did not see them needing to strengthen in the middle of the park, but as Chelsea season-ticket holder and friend of SpursStatMan.com Joe Steppel repeatedly told me, a robust and dominating presence was the missing piece in the jigsaw. On the right, last weekend’s second-half hat-trick against Fulham should see André Schürrle selected ahead of Willian, although the importance of this game combined with the memory of the German’s wretched first-half display could see the first-choice Brazilian restored to the line-up. Oscar should start in the middle, although his performances have dipped of late, while Eden Hazard will certainly wide left and, in all probability, win the game on his own. Spurs’ saving grace is that their depleted defence will only have to deal with Samuel Eto’o or Fernando Torres, neither of whom have been much use since 2010. Goodness knows how bad things could get if Romelu Lukaku had not been loaned out to Everton. Eto’o and Torres are not even at the stage where one can say that their lack of goals is balanced out by their positional play or their defensive contribution: selecting either is equal to voluntarily playing with ten men. It is Chelsea’s good fortune that the ten they have are so ludicrously talented that it does not matter that the eleventh is an empty shirt. In this situation, Tottenham more or less need a miracle to get a result out of the Blues. Instead, they cross London plagued with injuries and likely to field a patchwork defence. Tim Sherwood has said that they will play without fear and are going to go for the win. Many an underdog has said the same but few have achieved their goal. With Chelsea unbeaten at home in 23 league games, this could get very ugly very quickly.